In the market for a new mattress? Well say hello to Brighter. Brighter is a mattress company that has recently launched its 100% foam mattress. With so many new companies joining the industry, will Brighter be able to make a name for itself? Continue reading below to find out! In a hurry? Click here to go straight to the review summary. The Brighter mattress is an all-foam mattress built from three separate foam layers, which total 22 cm in depth. 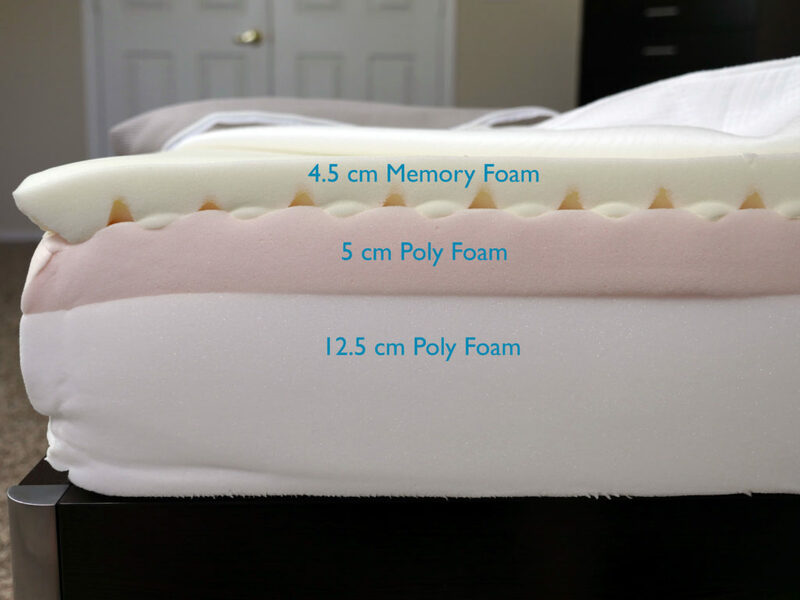 Top layer (comfort & support) – 4.5 cm of memory foam. The top layer of this mattress is designed to provide the initial level of comfort and pressure relief for the sleeper. Additionally, this top layer is split into seven different zones, each containing a varying density. This provides sleepers with more support where they need it and less where they don’t. Middle layer (transition) – 5 cm of poly foam. The middle layer acts as the transitional layer between the softer yet supportive top layer and the denser bottom layer. Although it does act primarily as the transitional layer, this layer also provides a certain level of support for the sleeper. Bottom layer (foundation) – 12.5 cm of poly foam. 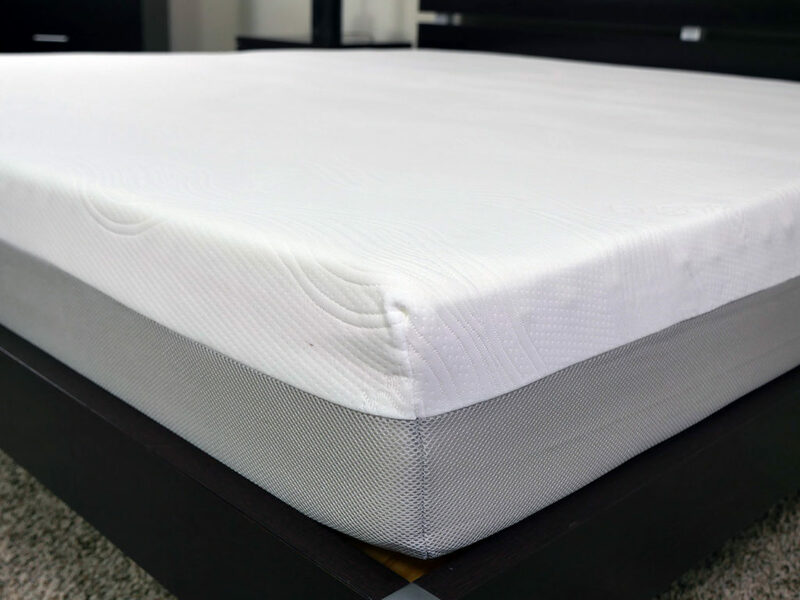 The bottom layer of this mattress is designed to act as the foundational base for the mattress. This layer may also offer a degree of deep compression support for some sleepers. The cover of the Brighter mattress is made from a combination of polyester and cotton in addition to a Coolmax yarn. The Coolmax yarn used by Brighter helps to wick away moisture and better regulate sleeping temperatures. By blending all three of these materials, the cover feels and acts similar to performance sportswear. It is highly breathable and quite thin. Aesthetically speaking, the mattress adopted what has become the staple design for most online mattress companies. Although the company did go with the white top and grey side panels, the top piece of fabric also contains the Brighter name embossed in several areas. In addition to the Brighter logo is a wavy pattern. All things considered, Brighter did a nice job of taking a basic cover and adding a bit of flair to it. By no means is the cover overwhelming, but it certainly has a nice modern touch to it. The Brighter mattress lands in that “universal comfort” category, garnering a 7 out of 10 on the firmness scale, where 10 is the most firm. As a universal comfort mattress, Brighter went with this medium-firm to slightly firm feel with the hope of meeting a wider array of sleepers’ preferences and needs. For starters, this mattress contains a well balanced feel. Although it is a memory foam mattress, the level of sinkage is slightly subdued due to a bit of a firmer feel. That said, the sinkage matches up well with the level of pressure relief and support you receive from the mattress. While sleepers may find themselves floating on this mattress, that does not mean there will be no pressure relief. In fact, I felt as if this mattress did a nice job of relieving my pressure points, even as a lighter sleeper (10 stones). Next up, support. Once again, the floating feel does make a difference in the level of support. Since sleepers see less sinkage with this mattress, spinal alignment tends to be more consistent. Typically, memory foam mattresses offer a deeper level of sinkage, which can lead to issues with spine alignment, depending on the sleeper’s desired sleeping position. As a stomach sleeper, I was able to sink slightly into the mattress while still receiving a very supportive feel. Sleeping on my back was extremely similar, but as I rolled over onto my side I did notice some pressure points and a bit of an uncomfortable feel. Granted, the mattress still had a good level of support. 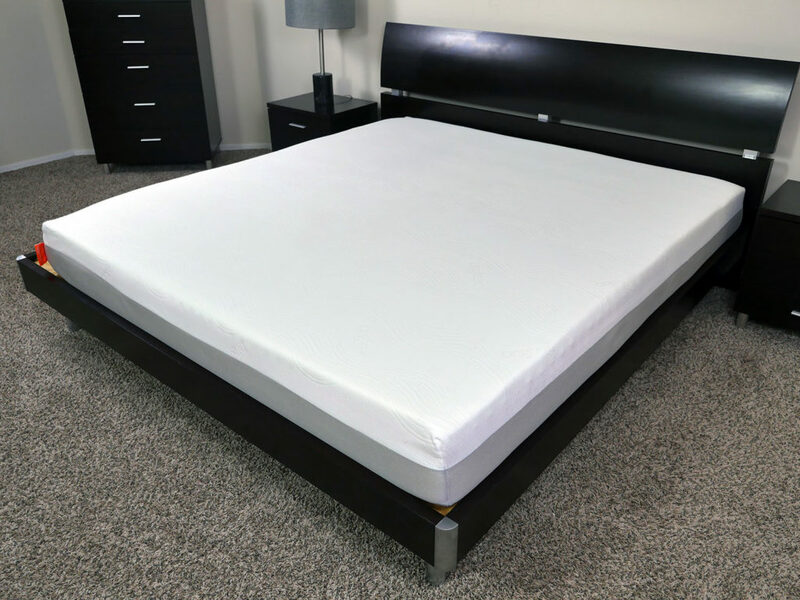 A major part of the supportive feel associated with this mattress has to do with seven zones of comfort integrated into the top layer of foam. Lighter support around your head and feet surrounds a much more supportive middle section. This combination creates a high level of support in the lower back area. Next up, we’ll discuss bounce and motion transfer. While bounce was not what you would get from an spring or hybrid mattress, the Brighter has an above average level of response and bounce for an all foam mattress. If you have an active lifestyle with regard to amorous activities, but still enjoy the feel of a memory foam mattress, the Brighter should not be overlooked. Motion transfer was not bad on this mattress, but it wasn’t amazing either. During my motion transfer testing, my wife and I were both able to feel one another move quite easily. I think this is likely due to the relative thinness of the mattress, coupled with the slightly firmer feel. Finally, cooling. To my surprise, this mattress slept pretty cool. The floating feel definitely played a role here. In addition, the thinner cover and moisture wicking materials certainly helped as well. Upon initial contact with the mattress, I noticed a cool-to-the-touch feel. After lying on the mattress for about 15-20 minutes, the mattress hit more of a neutral temperature and remained at this same temperature for the entirety of the night. All mattress reviews on Sleepopolis involve a short series of sinkage tests. These tests are designed to provide you with insight into how the mattress responds to various positions. Lying on your back – As I lay down normally on my back with my weight spread evenly across the mattress, I saw 4 cm of sinkage. Lying on your side – As I rolled over to my side, I saw 4 cm of sinkage. Sitting on edge (aggressive) – As I sat more on the direct edge of the mattress, I saw 9-9.5 cm of sinkage. Standing in the middle – With all of my weight placed at one point in the middle of the mattress, I saw 12.5 cm of sinkage. Who should buy the Brighter mattress? All in all, Brighter is a pretty solid mattress. An all foam mattress with above average response times and a slightly firmer feel makes for one of the nicer UK mattresses I have had the opportunity to review. Want a medium-firm to slightly feel – the Brighter mattress comes in at a 7 out of 10 on the firmness scale, where 10 is the most firm. Although this mattress offers a medium-firm to slightly feel, it is designed to meet the needs of a vast majority of sleepers. 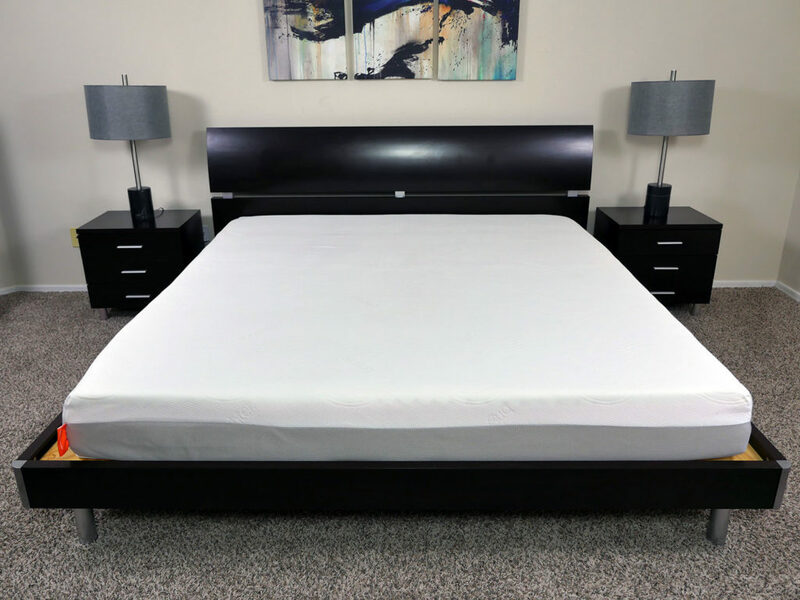 Want a memory foam mattress – as a memory foam mattress, Brighter is going to have slower response times, less motion transfer and bounce, good pressure relief, and a sharper contour as compared to latex and spring / coil mattresses. You will want to be sure you’re a fan of these characteristics before moving forward with this mattress. Like the idea of a floating feel – with a slightly firmer feel, this mattress offers a bit of a floating feel as compared to most memory foam mattresses. Instead of sinking deeply into the mattress you will notice more of an “on-top” feel. Therefore, you don’t have to worry about feeling stuck in this mattress. For more on the Brighter mattress visit BrighterMattress.co. Brighter is a mattress that has recently hit the market and is quickly making a name for itself. If you’re a sleeper who enjoys memory foam, but hates the idea of sinking to deeply into the mattress, Brighter could be a great choice. With a slightly firmer feel, the Brighter mattress offers more of a floating feeling as compared to most other memory foam mattresses. Additionally, this mattress is still able to provide nice levels of contour and pressure relief.